Terrorist Attack in France - No need to pray for the gods, but pray for the governments not to feed the terrorists. 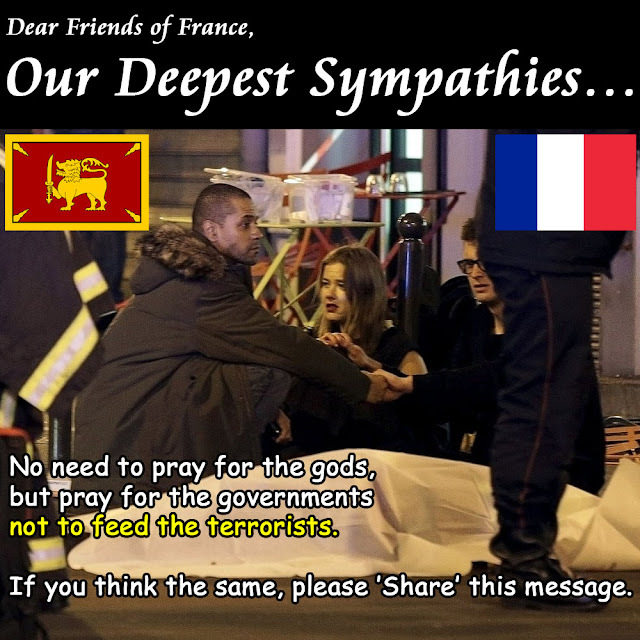 It is with deep sadness that we extend our tearful and sorrowful condolences and sympathies to all the victims and their families as well as the people of ‪‎France who are affected tremendously by this insane and barbaric terror attacks in ‪‎Paris‬ by extremist ‪‎Islamic Terrorists. Our humanity in this 21st century have to rally behind in one side to face off this heartless and inhuman terrorism which should not exist in this era and beyond. We have to save this generation and next generations from this extreme peril. We join the humanity around the world to denounce such brutal and cruel path of the terrorists, and wish to bring lasting peace to our planet earth. Since 1983 ‪‎Sri Lanka‬ has been suffered from ‪LTTE‬ terrorism, hundreds of thousands of innocents around Colombo died by Suicide Bomb blasts, and finally in 2009 we Sri Lankans could be able to completely eradicate the terrorism using government army forces. We have proofs that some of the world leaders fed the LTTE terrorism to keep a small country like Sri Lanka under their control. At the final stage of the war, foreign minister of the France Mr Bernard Kouchner arrived to Sri Lanka and pressured the Ex President to save the LTTE terrorist leader Prabhakaran, but he didn’t succeed. Source. Still the international community trying to revenge from Sri Lankan forces using so called alleged #‎war crimes . What we expect from the people of France and all others who against the terrorism, do not let your government to help terrorists to achieve the political gains. Sadly the new Sri Lankan government also not on the right track. The tragic incident may a lesson for all the corrupted politicians and terrorist sympathizers around the world. පළමුව ඇයි ඔවුන් extermist ‪‎Islamic‬ Terrorists.